The American Society for Metabolic and Bariatric Surgery (ASMBS) issued a position statement on the role of bariatric surgery in class I obesity in 2012 . That statement was developed in response to inquiries made to the ASMBS by society members, physicians, patients, hospitals, health insurance payers, policymakers, and the media regarding the safety and efficacy of bariatric surgery for patients with body mass index (BMI) 30 to 35 kg/m2. In the evolving field of bariatric and metabolic surgery, the Clinical Issues Committee of ASMBS recognized the necessity to update the position statement since additional high-quality data has emerged in the past 5 years to support bariatric surgery in class I obesity. In this updated statement, the ASMBS recommendations are presented that are derived from available knowledge, peer-reviewed scientific literature, and expert opinion. The statement may be revised in the future should additional evidence become available. The statement is not intended as, and should not be construed as, stating or establishing a local, regional, or national standard of care. The global pandemic of obesity and its associated comorbidities have become a major burden to individual patients and society at large. Over the last 4 decades, worldwide prevalence of obesity (BMI ≥30 kg/m2) increased from 3% to 10% in men and from 6% to 15% in women . In 2015, the prevalence of obesity in the United States among adult women and men was 35% and 31%, respectively. In 2015, obesity contributed to 4 million deaths worldwide. Cardiovascular disease and diabetes were the leading causes of death and disability-adjusted life-years related to high BMI . Particularly in the United States, between 1999–2002 and 2011–2014, the percentage of adults with class I obesity increased from 17.9% to 20.6%. In the United States, more than half of those who are obese fall into the class 1 obesity range . The American Medical Association now recognizes obesity, defined as a BMI ≥30, as a chronic multisystem disease, which is associated with multiple anatomic, physiologic, and psychological consequences . Management of obesity along with its co-morbidities requires a chronic disease model of care that includes various therapies, such as lifestyle, pharmacologic, and surgical intervention to improve long-term outcomes . The principal purpose of this review was to assess the evidence regarding the benefits and risks of bariatric surgery in patients with class I obesity (BMI of 30.0–34.9 kg/m2), which constitutes >20% of the U.S. population . The current high-quality data support lowering the arbitrary BMI inclusion criteria of 35 kg/m2 for bariatric surgery, which was established >25 years ago [6–8]. Class I obesity is associated with increased risk of medical and psychological co-morbidities. The risk of developing diabetes, hypertension, and dyslipidemia increases with weight gain. Furthermore, weight loss can significantly reduce the incidence of these cardiometabolic risk factors. Several studies have shown associations between class I obesity and nonalcoholic fatty liver disease, obstructive sleep apnea (OSA), polycystic ovary syndrome, and bone and joint diseases, among others [9–18]. Excess weight is increasingly recognized as an important risk factor for some cancers [19–24]. A large standardized meta-analysis showed that in men, a 5-kg/m2 increase in BMI was strongly associated with esophageal, thyroid, colon, and renal cancers. In women, strong associations between a 5 kg/m2 increase in BMI and endometrial, gallbladder, esophageal, and renal cancers were found. Furthermore, weaker positive associations (relative risk <1.2) between increased BMI and many other cancers were observed . A meta-analysis of 89 studies showed significant associations between all classes of overweight/obesity and type 2 diabetes, hypertension, coronary artery disease, congestive heart failure, stroke, asthma, pulmonary embolism, gallbladder disease, 9 common cancers, osteoarthritis, and chronic back pain. Although patients with class I obesity were not separately analyzed from overweight or patients with more severe forms of obesity, the findings were consistent in overweight and all 3 classes of obesity, showing the effect of class I obesity in the pathogenesis of these conditions . From a mortality standpoint, an adjusted collaborative analysis of data from almost 900,000 adults in 57 prospective studies showed that overall mortality was lowest at approximately 22.5 to 25 kg/m2 in both sexes and at all ages. Above this range, each 5 kg/m2 higher BMI was associated with approximately 30% higher all-cause mortality (40% for vascular; 60%–120% for diabetic, renal, and hepatic; 10% for neoplastic; and 20% for respiratory and for all other mortality). At 30 to 35 kg/m2, median survival was reduced by 2 to 4 years . It is important to mention that BMI alone is a poor indicator of adiposity, metabolic disease, and cardiovascular risk. Individuals with the same BMI can have significantly different health conditions given the presence of different visceral fat versus muscle mass [9,26–29]. For example, the health risk in a patient with BMI 33 kg/m2 with visceral and ectopic fat accumulation and subsequent metabolic disease would be significantly higher than that of a metabolically healthy obese individual with BMI 37 kg/m2. Altogether, we can conclude that class I obesity is a chronic disease that leads to additional serious comorbidities and can possibly shorten life expectancy . Therefore, class I obesity deserves effective and durable treatment. Safety and efficacy are 2 important factors when considering a treatment method in clinical practice. In the treatment algorithm for class I obesity, the best-tolerated treatment that is effective should be the preferred option. All individuals seeking weight loss should begin with nonsurgical therapy and consider bariatric surgery only if they are unable to achieve sufficient long-term weight loss and co-morbidity improvement with nonsurgical therapies . Lifestyle modification programs designed to improve eating habits and physical activity are the first option for weight control in class I obesity, given their low cost and the minimal risk of adverse events. However, the modest weight loss is only partly maintained over time and weight regain is common after discontinuation of lifestyle intervention program [30–34]. Pharmacotherapy is also indicated to augment the weight loss effects of lifestyle interventions in individuals with class I obesity. Currently, there are 4 approved monotherapies (orlistat, phentermine, lorcaserin, and liraglutide) and 2 combination weight loss medications (phentermine–topiramate and naltrexone–bupropion) with different mechanisms of action. However, patients are often disappointed by modest weight loss, high cost, and adverse events [35–41]. Endoscopic intraluminal procedures including temporary intragastric balloons, gastric partitioning procedures, and gastrointestinal liners have been developed to mimic the effects of bariatric surgery [42–45]. However, the outcomes of endoscopic treatments have not been consistent to date. Specifically, the high-quality data on safety, tolerability, efficacy, and durability of these procedures in patients with class I obesity is limited. For most people with class I obesity, therefore, it is clear that the nonsurgical group of therapies will not provide a durable solution to their disease of obesity. The majority of individuals with class I obesity will not lose a substantial amount of weight with these measures, and for those who do lose weight, the majority will regain the weight within 1 to 2 years. Systematic reviews of the numerous randomized controlled trials (RCTs) of programs incorporating diets, exercise, pharmacotherapy, and behavioral therapy have reported a mean weight loss in the range of 2 to 6 kg at ≤1 year and poor maintenance of that weight loss beyond that time [1,9,34–37]. Nonetheless, within the total group of participants studied in these trials and within the general practice of bariatric medicine, approximately 25% to 50% of individuals can achieve substantial weight loss (>10% weight) at 1 year and some have been able to maintain meaningful weight loss for several years. Therefore, before considering surgical treatment for obesity for any individual, an adequate trial of nonsurgical therapy should always be required. If, however, the attempts at treating their obesity and obesity-related co-morbidities have not been effective, we must recognize that the individual has a disease that threatens their health and decreases their life expectancy and as such, we must seek an effective, durable therapy, such as bariatric surgery [1,9,35]. The morbidity and mortality caused by the disease of obesity is well established and has long been recognized by all major advisory bodies, including a National Institutes of Health consensus development conference on obesity in 1985 and a subsequent separate consensus conference on gastrointestinal surgery for obesity held in March 1991, which considered the role of bariatric surgery for these patients . A synthesis of the views of the opinion leaders present at that time recommended that bariatric surgery should be considered for those patients with class II and class III obesity (BMI >35 kg/m2). Since the National Institutes of Health consensus conference, new procedures have been introduced and laparoscopy has largely replaced open surgery, with higher levels of scientific evidence now available regarding the health hazards of obesity and the improved risks and benefits of bariatric surgery [46,47]. Given the major changes that have occurred in this field, it is appropriate to review the data now available, and in the context of bariatric surgery as it is currently practiced, consider modification of the arbitrary recommendations established >25 years ago . Despite attempts to update the recommendations of the original guidelines [7,8], private health insurers and Medicare continue to rely on the 1991 consensus conference guidelines to set a baseline for BMI above which bariatric surgery offers a favorable risk/benefit ratio. The correct placement of that baseline is of critical importance to the patient, the healthcare provider, and the payer. In particular, the time has come to address the appropriate role of bariatric surgery for the treatment of patients with class I obesity. This discussion should consider whether class I obesity is a clinically relevant health problem, whether it is adequately managed by nonsurgical means, and whether there is evidence that bariatric surgical procedures provide a well-tolerated and cost-effective treatment approach . Access to bariatric surgery should not be denied to a patient with class I obesity associated to significant obesity-related co-morbidity simply on the basis of the BMI level, which alone is an inaccurate index of adiposity and a poor health risk predictor. Patients with class I obesity who are not able to achieve adequate weight loss after a reasonable period of nonsurgical therapy should be considered for bariatric surgery. Bariatric surgery should be considered in patients with class I obesity on an individual basis and after a comprehensive clinical evaluation of the patient’s global health and a prediction of its future disease risk. The use of bariatric surgery in patients with class I obesity should be considered only after failure of proper nonsurgical therapy. Indication for bariatric surgery in class I obesity should be based more on the co-morbidity burden than on BMI levels. Co-morbidities should be evaluated considering their likely response to surgery and in relation to how they can be treated by established medical therapies. The second Diabetes Surgery Summit was an international consensus conference that recently convened to collaborate with leading diabetes organizations to develop global guidelines about the benefits and limitations of bariatric and metabolic surgery for type 2 diabetes. The Diabetes Surgery Summit guidelines were formally endorsed by 45 worldwide medical and scientific societies, including the International Diabetes Federation and the American Diabetes Association . The guidelines state that metabolic surgery should be considered an option to treat type 2 diabetes in patients with class I obesity and inadequately controlled hyperglycemia despite optimal medical treatment by either oral or injectable medications (including insulin). The National Institute for Health and Care Excellence guidelines are evidence-based recommendations for health and care in England. The most recent National Institute for Health and Care Excellence guideline on obesity was issued in 2014 , stating that an assessment for bariatric surgery in people with a BMI of 30 to 34.9 who have recent-onset type 2 diabetes (defined as a duration of ≤10 yr) is considered as long as they are also receiving or will receive assessment in a tier 3 service (per National Health Service England’s report, tier 3 covers specialist weight management services). There is a robust body of literature to support the safety profile and efficacy of bariatric surgery in patients with class I obesity. The first ASMBS position statement in 2012 summarized data from 4 RCTs [50–53], 16 observational studies, and 1 meta-analysis  on outcomes of bariatric surgery in patients with BMI 30 to 35 kg/m2 . In the last 5 years, there is mounting evidence to support surgical treatment of obesity in patients with class I obesity. Since the publication of our first position statement, there have been an additional 10 systematic reviews and meta-analyses [55–64] (for a total of 11), and 8 RCTs [65–80] (for a total of 12) examining the safety and efficacy of metabolic/bariatric surgery for patients with a BMI <35 kg/m2. These analyses continue to demonstrate a marked and durable improvement in co-morbid conditions, especially type 2 diabetes, as well as significant weight loss compared with medical therapy in patients with class I obesity. Li et al. was the first to publish a meta-analysis in 2012. This group evaluated 13 studies on various bariatric procedures, all of which evaluated patients with a BMI <35 kg/m2. The analysis showed that 80.0% of patients were able to achieve glycemic control defined as gylcated hemoglobin (HbA1C) <7% without medications. This review reported a low incidence of complications as well (3.2%) with no mortalities. Reis et al. conducted a literature review on the role of various surgeries in patients with type 2 diabetes and BMI <35 kg/m2. They found a total of 29 studies examining ileal-interposition, duodenojejunal bypass, biliopancreatic diversion (BPD), Roux-en-Y gastric bypass (RYGB), single-anastomosis gastric bypass, sleeve gastrectomy (SG), and adjustable gastric banding (AGB). They found a mean 5-kg/m2 decrease in BMI. 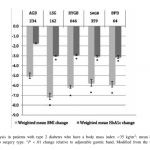 In their analysis, the RYGB and single-anastomosis gastric bypass resulted in better glycemic control, defined as HbA1C <6% without antidiabetic medications (70% and 72%, respectively) compared with the others listed. Parikh et al. published a large systematic review with a variety of surgical interventions examining patients with type 2 diabetes and class 1 obesity. They found that at 12 months, the rate of diabetes remission (HbA1C <6.5% without medications) was 55% (95% confidence interval, 44%–65%). Rate of remission ranged with procedure performed; AGB had the lowest rate of diabetes remission (33%), single-anastomosis gastric bypass with 49%, SG with 54%, RYGB with 64%, and BPD with 70%. They found a low incidence of major complications (5.4%) and mortality (.4%). A review from the Agency for Healthcare Research and Quality analyzed 24 studies examining safety and efficacy of surgical intervention versus medical therapies with a wide range of follow-up . This comprehensive report showed that favorable cardiometabolic changes were more prominent after bariatric surgery compared with lifestyle/medical interventions. The review concluded that there is moderate strength evidence of efficacy for RYGB, AGB, and SG as treatment for diabetes and prediabetes in patients with class I obesity in the short term (up to 2 yr). The strength of evidence for BPD was rated low because there were fewer studies with smaller sample sizes. Improvements in hypertension, low-density lipoprotein cholesterol, triglycerides, obstructive sleep apnea, and gastroesophageal reflux disease were also reported in some surgical studies. Short-term rates of adverse events associated with bariatric surgery were relatively low. One death, a case of sepsis at 20 months in an AGB patient, was reported. Short-term complications were minor and tended not to require major intervention. The report also showed that unwanted excessive weight loss would be very rare after standard bariatric procedures. Ngiam et al. published a large analysis on a variety of surgical interventions for class I obesity. They found that the magnitude of weighted HbA1C change in patients with BMI <35 kg/m2 undergoing bariatric surgery is similar to patients with BMI >35 kg/m2 (−2.8% versus −2.7%), despite having a smaller reduction in weighted BMI (−5.5 versus −13.9 kg/m2). This would alleviate some fear that bariatric surgery in class I obesity will result in excessive weight loss and malnutrition. The review found AGB and duodenojejunal bypass were inferior to other surgeries in reducing BMI and HbA1C. The mean rate of all complications was 8.1% across all types of surgeries. There were a total of 5 mortalities reported across all studies giving a mortality rate of .02%. Adegbola et al. reviewed a smaller series of strictly AGB patients with BMI <35 kg/m2. These 6 studies reported a mean excess weight loss of 58% to 87% at 2 years. They also reported improvement of co-morbid conditions, most commonly type 2 diabetes, depression, arthritis, hyperlipidemia, and obstructive sleep apnea, as well as metabolic syndrome. Thirty-four patients (6.6%) developed complications. Adverse events were most commonly related to band complications (n=30, 5.8%), such as slippage or migration (3.9%) and rarely erosion (.4%). Muller-Stich et al. published a large systematic review of randomized and nonrandomized controlled studies that directly compared surgical versus medical therapy in the treatment of diabetes with a short-term follow-up of 1 to 3 years. While all 13 included studies had patients with BMI <35 kg/m2, one caveat is that the review was not solely on class I obesity and some studies had patients with BMI >35 kg/m2. This analysis found that bariatric surgery was associated with a higher diabetes remission rate (odds ratio [OR]: 14), higher rate of glycemic control (OR: 8), and lower HbA1C level (mean difference: −1.4%) than medical treatment. BMI (mean difference: −5.5 kg/m2), rate of arterial hypertension, and dyslipidemia were significantly lower after surgery. A smaller systematic review and meta-analysis, the study by Rao et al. examined the effect of RYGB on diabetes solely in patients with BMI <35 kg/m2. There was a significant decrease in HbA1C (−2.8%) as well as plasma glucose (−60 mg/dL). They reported zero deaths and mean hospital stay was 2.0 to 3.2 days. Panunzi et al. performed a meta-analysis to study the efficacy of bariatric surgery in remission of diabetes in patients with BMI <35 kg/m2 versus those with BMI >35 kg/m2. The estimated average proportion of diabetic patients who experienced remission after surgery was similar between BMI ≥35 kg/m2 and BMI <35 kg/m2 groups (71% and 72%, respectively). A meta-regression analysis demonstrated that preoperative BMI was not an independent factor in the remission of diabetes. There was also an improvement in HbA1C that was independent of preoperative BMI, with an average decrease of 2.7%. In a subgroup analysis, diabetes remission rate was 89% after BPD, 77% after RYGB, 62% after AGB, and 60% after SG. Cummings and Cohen  published a meta-analysis of 11 RCTs. They calculated the OR of surgical intervention versus lifestyle/medical intervention in diabetes remission at a range of follow-up intervals from 6 to 60 months. Of the 11 trials, there was only 1 study in which the OR crossed 1 in which the surgical intervention compared was AGB. In the other 10 trials, they demonstrated that surgery significantly improves diabetes more than medical or lifestyle changes. The strengths of this review were that they included only level 1 evidence from RCTs. However, the RCTs included patients with BMI >35 kg/m2 as well. Recently, Cohen et al. conducted a meta-analysis on 5 RCTs to assess the impact of RYGB on type 2 diabetes in patients with BMI 30 to 40 kg/m2. At the longest follow-up, RYGB significantly improved total and partial diabetes remission (OR 17, 95% confidence interval 4–71 and OR 20, 95% confidence interval 5–83, respectively). In addition, HbA1C was reduced by −1.8% at longest follow-up after surgery. There have been 8 interval RCTs [65–80] published since the last position statement for a total of 12 high-quality clinical trials. Some of the RCTs were later updated with longer follow-up describing the same patient population; thus, the paper with the longer follow-up is included in Table 2. Of these, 5 deserve special mention. O’Brien et al. [51,65] published the first RCT to examine patients with class I obesity and obesity-related comorbid diseases, randomizing between the AGB versus medical therapy. Eighty patients were randomized to the band (n=40) or to medical therapy (n=40), which included behavioral modification, very low-calorie diet, and pharmacotherapy. The AGB group had an excess weight loss of 87% compared with 22% in the medical therapy group at a 2-year follow-up with a follow-up rate of 98% in the surgical group and 83% in the medical group. Quality of life improved significantly in the surgical group compared with the nonsurgical group. There were no significant adverse events, but 4 patients in the surgical group did require reoperative procedures for posterior prolapse of their band . This group published a long-term follow-up at 10 years, which confirmed that surgery produces durable weight loss as well as diabetes remission . The surgical group had a mean 10-year weight loss of 14 kg (63% excess weight loss), which was significantly better than the nonsurgical group (.4 kg; P < .001). Overall, 7 (12%) patients required band removal . Parikh et al. studied 57 patients with class I obesity and type 2 diabetes. Twenty-eight patients were randomized to medical weight management involving diet, exercise, and diabetes medications. Twenty-nine patients were randomized to bariatric surgery and had the choice to undergo RYGB, AGB, or SG based on preference; SG was the most popular procedure (n=16). The surgical group had significantly greater diabetes remission at 6-month follow-up (65% versus 0%, P < .0001; defined as HbA1C <6.5% or fasting plasma glucose <126 or glucose <200 at 120 minutes after 75 g oral glucose load without use of diabetes medications). The surgical arm also had a lower HbA1C (6.2% versus 7.8%, P=.002), as well as better weight loss (−7.0 kg/m2 versus −1.0 kg/m2 change in BMI). The investigators attributed the lack of significant difference in lipid panel and blood pressure to the fact that patients were normotensive and did not have hyperlipidemia preoperatively. 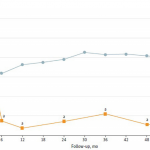 Seven patients crossed over from the medical to surgical arm at 6 months; of these, 3 patients experienced diabetes remission at mean follow up of <6 months, suggesting that failure of medical management may be an indication for surgical therapy. There were 2 minor complications in the surgical arm, 1 patient required intravenous fluid hydration for dehydration, while another developed an abscess at a trocar site requiring drainage and antibiotics . Wentworth et al. [67,68] studied the effect of bariatric surgery, specifically AGB, in the remission of diabetes in overweight patients with BMI between 25 and 30 kg/m2. Overall, 51 patients underwent randomization into AGB (n=25) or medical management with calorie-restricted diet (n=26). The main outcome was diabetes remission, which was reported 2  and 5 years after randomization . There was a significant difference in average weight lost: 12.2% versus 1.8% in the surgical and the medical management groups, respectively. At 5 years, 23% of the surgical group achieved remission (defined as normalization of laboratory glucose measurements off of diabetes medications) compared with 9% of the medical arm. 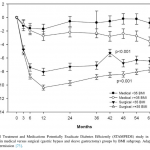 The gastric band participants used fewer glucose-lowering medications, and their averaged HbA1C over the 5 years of follow-up was significantly lower than that of control group participants. Furthermore, significant improvement in indices of lipid profile and quality of life was observed after surgery. Two patients required surgical revision of their AGB. There were no mortalities reported for this series. The study concluded that sustained weight loss of 10% weight is a powerful therapy for overweight people with type 2 diabetes because it delivers clinically meaningful improvements in HbA1C, high-density lipoprotein cholesterol, and quality of life, and decreases the cost of glucose-lowering drug therapy . Ikramuddin et al. [69–71] studied 120 patients randomized to medical therapy or RYGB for treatment of diabetes. The study included patients with BMI 30 to 39.9 kg/m2; 71 patients had BMI <35 kg/m2, which was separately reported . Surgical therapy was found to result in better control of diabetes with 17% experiencing full remission (HbA1C <6%) at the 3-year follow-up and 19% experiencing partial remission (HbA1C <6.5%) of diabetes compared with 0% with HbA1C <6.5% in the medical arm. The surgical arm experienced greater weight reduction as well, with a mean weight loss of 21.0% versus 6.3%. The 2 groups’ weight loss differed by 14.8% at 36 months. In addition, at 36 months, the triple endpoint goal of HbA1C, low-density lipoprotein cholesterol, and systolic blood pressure reduction was met in 28% of RYGB patients and only 9% of lifestyle-medical management patients (P=.01). Over 3 years, there were 51 serious or clinically significant adverse events in the RYGB group and 24 in the medical group. There was 1 mortality in the medical group (pancreatic cancer). A cerebrovascular event occurred in 1 RYGB patient as a complication of surgery . A subgroup analysis of 71 participants with BMI 30 to 35 kg/m2 at 2 years showed that none of the patients in the medical arm had partial or complete remission of diabetes. In the RYGB group, however, a substantial proportion of the patients achieved complete or partial diabetes remission (57% in Taiwanese and 27% in American participants) . Schauer et al. recently published their 5-year outcome data for their Surgical Treatment and Medications Potentially Eradicate Diabetes Efficiently (STAMPEDE) trial. This 3-armed trial compared intensive medical therapy, RYGB, and SG [53,73,74]. In total, 37% of the patients had a preoperative BMI <35 kg/m2, and of the 150 patients originally enrolled, they reported 90% follow-up rate at 5 years. Both surgical therapy groups demonstrated statistically superior weight loss and diabetes remission at 1, 3, and 5 years [53,73,74]. Patients who underwent surgical procedures had a greater mean percentage reduction from baseline in HbA1C level than did patients who received medical therapy alone (2.1% versus .3%, P=.003). At 5 years, changes from baseline observed in the RYGB and SG groups were superior to the changes seen in the medical-therapy group with respect to weight (−23%, −19%, and −5% in the RYGB, SG, and medical-therapy groups, respectively), triglyceride level (−40%, −29%, and −8%), high-density lipoprotein cholesterol level (32%, 30%, and 7%), use of insulin (−35%, −34%, and −13%), and quality-of-life measures (P < .05 for all comparisons). No major late surgical complications were reported except for 1 reoperation . As illustrated in Fig. 1, there is a similar decrease in postoperative HbA1C at 5 years in patients with BMI <35 compared with BMI > 35 kg/m2; thus, demonstrating that preoperative BMI does not predict magnitude of glycemic response after bariatric surgery. In addition, as shown in Fig. 2, there is a smaller change in postoperative BMI in patients with a preoperative BMI <35, with an average 7-kg/m2 decrease in BMI in this patient group. This is likely due to the body’s compensatory physiologic mechanisms, and helps mitigate concern that bariatric surgery in class I obesity will result in excessive weight loss and malnutrition . Multiple prospective and retrospective observational studies have shown the safety and efficacy of various bariatric surgical procedures is class I obesity [81–91]. Selected literature has been summarized in Table 3. These studies reported surgical risk, weight loss results, and co-morbidity reduction consistent with what has been reported for severe obesity. Improvement in glycemic control (Fig. 3), hypertension, dyslipidemia, fatty liver disease, obstructive sleep apnea, asthma, joint pain, urinary incontinence, gastroesophageal reflux disease, and quality of life has been reported in these studies. Small numbers of patients, lack of control data, and short-term follow-up, however, limit most of these observational studies. There was also variability in the method of weight and co-morbidity reporting. 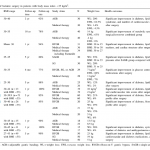 According to these studies, patients with class I obesity do not lose excessive weight after bariatric procedures, and BMI usually stabilizes around 25 kg/m2 (Table 3). Notably, the data on safety and efficacy of bariatric surgery in adolescents and in elderly patients with class I obesity are very limited. According to the literature, as shown before (Tables 1–3), bariatric surgery is associated with modest morbidity and very low mortality in patients with class I obesity. Furthermore, among 1300 patients with diabetes and a BMI <35 kg/m2 in the American College of Surgeons data set, the incidence of all individual major complications was ≤.5% after bariatric surgery except for postoperative bleeding (1.7%). Thirty-day postoperative composite morbidity, serious morbidity, and mortality rates for total cohort were 4.2%, .7%, and .15%, respectively. Reoperation within 30 days from the index surgery was necessary in 1.6% of patients. Smoking was identified as a modifiable risk factor for early complications after bariatric surgery in patients with diabetes and lower BMI. Thirty-day morbidity rates were not significantly different between those who underwent RYGB compared with SG . A total of 235 patients with type 2 diabetes and BMI <35 kg/m2 were included in the Bariatric Outcomes Longitudinal Database. AGB and RYGB were the most commonly reported surgical procedures in the study population, with 109 cases of each. Ninety-day complications were more common after RYGB compared with AGB (18% versus 3.3%, P < .05). The most commonly reported complications were minor in nature, including nausea/vomiting (n=5) and gastrointestinal anastomotic stricture (n=4). Serious complications including anastomotic leak, intraabdominal bleeding, and internal hernia were reported in 1 patient each after RYGB; no mortalities were reported . Recognition of efficacy and safety of surgery may not suffice for advocacy of bariatric surgery for class I obesity. Economic evaluation to determine the cost-effectiveness of bariatric surgery for mild obesity has also been performed. The majority of studies support cost-effectiveness of surgery over medical therapy in patients with severe obesity, especially in patients with type 2 diabetes. Recently, several clinical and economic reviews examined the value of bariatric surgery in class I obesity. According to one analysis, the cost-effectiveness estimates for bariatric surgery across all BMI classes over a 10-year period ranged approximately from $24,000 to $63,000 per quality-adjusted life year (QALY) gained versus conventional treatment, which would be within commonly-accepted thresholds for cost-effectiveness (i.e., $50,000–$100,000 per QALY gained). These findings were robust to a range of sensitivity analyses, including elimination of mortality benefit for bariatric surgery and complete weight regain 5 years after surgery. Importantly, while the most favorable results were seen in patients with BMI ≥40 due to greater weight loss (and corresponding gains in quality of life), surgery produces cost-effectiveness ratios within the commonly accepted range among those with class I obesity, with findings ranging from $40,000 to $60,000 per QALY gained versus conventional treatment. Interestingly, in contrast with bariatric surgery, the more modest weight loss achieved with vagal blocking therapy and naltrexone/bupropion therapy resulted in cost-effectiveness ratios ranging from $102,000 to $173,000 per QALY gained across all BMI classes [93,94]. In another analysis, the cost-effectiveness of RYGB in morbidly obese individuals was approximately $31,000 per QALY gained versus $53,000 per QALY gained in patients with BMI 30 to 35 kg/m2 (again within commonly-accepted thresholds for cost-effectiveness, i.e., $50,000–$100,000 per QALY gained) [94,95]. A cost-effectiveness evaluation of AGB in patients with class I obesity showed that surgery was more costly than nonsurgical management, but resulted in improved outcomes. The incremental cost-effectiveness ratio, which is a measure of the additional cost to achieve an additional benefit, reduced with a longer time horizon from £60,754 at 2 years to £12,763 at 20 years. In the probabilistic sensitivity analysis, the probability of surgical management being cost-effective (compared with an intensive medical program) was 98% at a willingness-to-pay threshold of £30,000 per QALY with a 20-year time horizon. In contrast, for a 2-year time horizon, the probability of surgical management being cost-effective was zero . The reduction in the incremental cost-effectiveness ratio with longer time horizons is driven by a greater proportion of people experiencing resolution of their diabetes in the surgical group, compared with the nonsurgical group . The decision regarding the choice of bariatric procedures must take into account the risk/benefit analysis for a particular patient, presence of obesity-related co-morbidities (e.g., type 2 diabetes, gastroesophageal reflux disease) as well as patient preferences . In the BMI 30- to 35- kg/m2 group and for bariatric surgery in general, there is currently no predictive method to match a particular patient with a particular operation to achieve the optimal outcome. Caregivers must have informative discussions with patients and reach a mutually agreeable option. Currently, high-level data support the use of laparoscopic AGB, SG, and RYGB in this population. RYGB and SG should be considered as preferred options for patients with type 2 diabetes who may benefit from the additional metabolic effects these procedures provide in addition to weight loss [Fig. 4]. In the final analysis, it remains up to the judgment of the treating physician and the patient to choose the option they feel is in the patient’s best interest. Class I obesity (BMI 30–35 kg/m2) causes or exacerbates multiple other diseases, decreases longevity, and impairs quality of life. Patients with class I obesity require durable treatment for their disease. Current nonsurgical treatments for class I obesity are often ineffective at achieving major, long-term weight reduction and resolution of co-morbidities. The existing BMI inclusion criterion of ≥35 kg/m2 as a prerequisite for bariatric and metabolic surgery—excluding individuals with class I obesity—was established arbitrarily more than a quarter century ago, in the era of open surgery when morbidity and mortality of surgery was significantly higher than today. There is no current evidence of clinical efficacy, cost-effectiveness, ethics, or equity that justifies this group being excluded from life-saving surgical treatment. Access to bariatric and metabolic surgery should not be denied solely based on this outdated threshold. For patients with BMI 30 to 35 kg/m2 and obesity-related co-morbidities who do not achieve substantial, durable weight loss and co-morbidity improvement with reasonable nonsurgical methods, bariatric surgery should be offered as an option for suitable individuals. In this population, surgical intervention should be considered after failure of nonsurgical treatments. Particularly given the presence of high-quality data in patients with type 2 diabetes, bariatric and metabolic surgery should be strongly considered for patients with BMI 30 to 35 kg/m2 and type 2 diabetes. AGB, SG, and RYGB have been shown to be well-tolerated and effective treatments for patients with BMI 30 to 35 kg/m2. Safety and efficacy of these procedures in low-BMI patients appear to be similar to results in patients with severe obesity. Perioperative and long-term nutritional, metabolic, and nonsurgical support must be provided to patients after surgery according to established standards, including the ASMBS Clinical Practice Guidelines . Currently, the best evidence for bariatric and metabolic surgery for patients with class I obesity and co-morbid conditions exists for patients in the 18 to 65 age group. This statement has been supported by the American Diabetes Association (ADA) and has been endorsed by the Society of American Gastrointestinal and Endoscopic Surgeons (SAGES). ASMBS Clinical Issues Committee Bariatric surgery in class I obesity (body mass index 30-35 kg/m2). Surg Obes Relat Dis 2013;9(1):e1–10. NCD Risk Factor Collaboration (NCD-RisC) Trends in adult body–mass index in 200 countries from 1975 to 2014: a pooled analysis of 1698 population-based measurement studies with 19.2 million participants. Lancet 2016;387(11026):1377–96. Afshin A, Forouzanfar MH, et al., GBD 2015 Obesity Collaborators Health effects of overweight and obesity in 195 countries over 25 years. N Engl J Med 2017;377(1):13–27. Health, United States, 2015. In Brief [mongraph on the Internet] Hyattsville: National Center for Health Statistics[cited yr mo d]. Feb 1, 2018, Available from: https://www.cdc.gov/nchs/data/hus/hus15_inbrief.pdf. Recognition of obesity as a disease [monograph on the Internet]. Chicago: American Medical Association House of Delegates; 2013[cited yr mo d]. Feb 1, 2018, Available from: http://www.npr.org/documents/2013/jun/ama-resolution-obesity.pdf. Gastrointestinal surgery for severe obesity: National Institutes of Health Consensus Development Conference statement. Am J Clin Nutr 1992;55(2 Suppl):615S–619S. DeMaria EJ, Schauer P, Patterson E, et al. The optimal surgical management of the super-obese patient: the debate. Surg Innov 2005;12(2):107–21. Sugerman HJ. Summary: consensus conference on surgery for severe obesity. Surg Obes Relat Dis 2005;1(3):369–70. Busetto L, Dixon J, De Luca M, Shikora S, Pories W, Angrisani L. Bariatric surgery in class I obesity: a Position Statement from the International Federation for the Surgery of Obesity and Metabolic Disorders (IFSO). Obes Surg 2014;24(4):487–519. Carnethon MR, De Chavez PJ, Biggs ML, et al. Association of weight status with mortality in adults with incident diabetes. JAMA 2012;308(6):581–90. Colditz GA, Willett WC, Rotnitzky A, et al. Weight gain as a risk factor for clinical diabetes mellitus in women. Ann Intern Med 1995;122(7):481–6. Chan JM, Rimm EB, Colditz GA, et al. Obesity, fat distribution, and weight gain as risk factors for clinical diabetes in men. Diabetes Care 1994;17(9):961–9. Nguyen NT, Magno CP, Lane KT, et al. Association of hypertension, diabetes, dyslipidemia, and metabolic syndrome with obesity: findings from the National Health and Nutrition Examination Survey, 1999 to 2004. J Am Coll Surg 2008;207(6):928–34. Dixon JB. The effect of obesity on health outcomes. Mol Cell Endocrinol 2010;316(2):104–8. Guh DP, Zhang W, Bansback N, Amarsi Z, Birmingham CL, Anis AH. The incidence of co-morbidities related to obesity and over- weight: a systematic review and meta-analysis. BMC Public Health 2009;9:88. Haslam DW, James WP. Obesity. Lancet 2005;366(9492):1197–209. Hartemink N, Boshuizen HC, Nagelkerke NJ, Jacobs MA, van Houwelingen HC. Combining risk estimates from observational studies with different exposure cutpoints: a meta-analysis on body mass index and diabetes type 2. Am J Epidemiol 2006;163(11):1042–52. Ni Mhurchu C, Rodgers A, Pan WH, Gu DF, Woodward Mfor the Asia Pacific Cohort Studies Collaboration. Body mass index and cardio- vascular disease in the Asia-Pacific Region: an overview of 33 cohorts involving 310000 participants. Int J Epidemiol 2004;33(4):751–8. Renehan AG, Tyson M, Egger M, et al. Body-mass index and incidence of cancer: a systematic review and meta-analysis of prospective observational studies. Lancet 2008;371(9612):569–78. Bergstrom A, Pisani P, Tenet V, Wolk A, Adami HO. Overweight as an avoidable cause of cancer in Europe. Int J Cancer 2001;91(3):421–30. Harvie M, Hooper L, Howell AH. Central obesity and breast cancer risk: a systematic review. Obes Rev 2003;4(3):157–73. Kubo A, Corley DA. Body mass index and adenocarcinomas of the esophagus or gastric cardia: a systematic review and meta-analysis. Cancer Epidemiol Biomarkers Prev 2006;15(5):872–8. Berrington de Gonzalez A, Sweetland S, Spencer E. A meta-analysis of obesity and the risk of pancreatic cancer. Br J Cancer 2003;89(3):519–23. MacInnis RJ, English DR. Body size and composition and prostate cancer risk: systematic review and meta-regression analysis. Cancer Causes Control 2006;17(8):989–1003. Whitlock G, Lewington S, et al., Prospective Studies Collaboration Body-mass index and cause- specific mortality in 900000 adults: collaborative analyses of 57 prospective studies. Lancet 2009;373(9669):1083–96. Müller MJ, Lagerpusch M, Enderle J, et al. Beyond the body mass index: tracking body composition in the pathogenesis of obesity and the metabolic syndrome. Obes Rev 2012;13(Suppl 2):6–13. Thomas EL, Frost G, Taylor-Robinson SD, et al. Excess body fat in obese and normal-weight subjects. Nutr Res Rev 2012;25(1):150–61. Kragelund C, Omland T. A farewell to body-mass index? Lancet 2005;366(9497):1589–91. Deurenberg P, Deurenberg-Yap M. Validity of body composition methods across ethnic population groups. Forum Nutr 2003;56:299–301. Heymsfield SB, van Mierlo CA, van der Knaap HC, et al. Weight management using a meal replacement strategy: meta and pooling analysis from six studies. Int J Obes Relat Metab Disord 2003;27(5):537–49. Mulholland Y, Nicokavoura E, Broom J, et al. Very-low-energy diets and morbidity: a systematic review of longer-term evidence. Br J Nutr 2012;108(5):832–51. Bravata DM, Sanders L, Huang J, et al. Efficacy and safety of low-carbohydrate diets: a systematic review. JAMA 2003;289(14):1837–50. Dansinger ML, Gleason JA, Griffith JL, Selker HP, Schaefer EJ. Comparison of the Atkins, Ornish, Weight Watchers, and Zone diets for weight loss and heart disease risk reduction: a randomized trial. JAMA 2005;293(1):43–53. Svetkey LP, Stevens VJ, Brantley PJ, et al. Comparison of strategies for sustaining weight loss: the weight loss maintenance randomized controlled trial. JAMA 2008;299(10):1139–48. Heymsfield SB, Wadden TA. Mechanisms, pathophysiology, and management of obesity. N Engl J Med 2017;376(15):254–66. Padwal R, Li SK, Lau DC. Long-term pharmacotherapy for overweight and obesity: a systematic review and meta-analysis of randomized controlled trials. Int J Obes Relat Metab Disord 2003;27(12):1437–46. Avenell A, Brown TJ, McGee MA, et al. What interventions should we add to weight reducing diets in adults with obesity? A systematic review of randomized controlled trials of adding drug therapy, exercise, behaviour therapy or combinations of these interventions. J Hum Nutr Diet 2004;17(4):293–316. Smith SR, Weissman NJ, Anderson CM, et al. Multicenter, placebo-controlled trial of lorcaserin for weight management. N Engl J Med 2010;363(3):245–56. Gadde KM, Allison DB, Ryan DH, et al. Effects of low-dose, controlled-release, phentermine plus topiramate combination on weight and associated comorbidities in overweight and obese adults (CONQUER): a randomised, placebo controlled, phase 3 trial. Lancet 2011;377(9774):1341–52. Garvey WT, Ryan DH, Look M, et al. Two-year sustained weight loss and metabolic benefits with controlled-release phentermine/topiramate in obese and overweight adults (SEQUEL): a randomized, placebo-controlled, phase 3 extension study. Am J Clin Nutr 2012;95(2):297–308. Greenway FL, Fujioka K, Plodkowski RA, et al. Effect of naltrexone plus bupropion on weight loss in overweight and obese adults (COR-I): a multicentre, randomised, double-blind, placebo–controlled, phase 3 trial. Lancet 2010;376(9741):595–605. Ponce J, Woodman G, Swain Jfor the REDUCE Pivotal Trial Investigators. The REDUCE pivotal trial: a prospective, randomized controlled pivotal trial of a dual intragastric balloon for the treatment of obesity. Surg Obes Relat Dis 2015;11(11):874–81. Sullivan S, Edmundowicz SA, Thompson CC. Endoscopic bariatric and metabolic therapies: new and emerging technologies. Gastroenterology 2017;152(7):1791–801. Lopez-Nava G, Sharaiha RZ, Vargas EJ, et al. Endoscopic sleeve gastroplasty for obesity: a multicenter study of 248 patients with 24 months follow-up. Obes Surg 2017;27(10):2649–55. Brethauer SA, Chang J, Galvao Neto M, Greve JW. Gastrointestinal devices for the treatment of type 2 diabetes. Surg Obes Relat Dis 2016;12(6):1256–61. Aminian A, Brethauer SA, Kirwan JP, Kashyap SR, Burguera B, Schauer PR. How safe is metabolic/diabetes surgery? Diabetes Obes Metab 2015;17(2):198–201. Aminian A, Jamal MH, Andalib A, et al. Is laparoscopic bariatric surgery a safe option in extremely high-risk morbidly obese patients? J Laparoendosc Adv Surg Tech A 2015;25(9):707–11. Rubino F, Nathan DM, Eckel RHfor the Delegates of the 2nd Diabetes Surgery Summit. Metabolic surgery in the treatment algorithm for type 2 diabetes: a joint statement by international diabetes organizations. Surg Obes Relat Dis 2016;12(6):1144–62. Obesity: identification, assessment and management [homepage on the Internet]. London: National Institute for Health and Care Excellence; c2018 [updated 2014 Nov; cited yr mo d]. Feb 1, 2018, Available from: https://www.nice.org.uk/guidance/cg189/chapter/1-recommendations. Dixon JB, O’Brien PE, Playfair J, et al. Adjustable gastric banding and conventional therapy for type 2 diabetes: a randomized controlled trial. JAMA 2008;299(3):316–23. O’Brien PE, Dixon JB, Laurie C, et al. Treatment of mild to moderate obesity with laparoscopic adjustable gastric banding or an intensive medical program: a randomized trial. Ann Intern Med 2006;144(9):625–33. Lee WJ, Chong K, Ser KH, et al. Gastric bypass vs sleeve gastrectomy for type 2 diabetes mellitus: a randomized controlled trial. Arch Surg 2011;146(2):143–8. Schauer PR, Kashyap SR, Wolski K, et al. Bariatric surgery versus intensive medical therapy in obese patients with diabetes. N Engl J Med 2012;366(17):1567–76 26. Li Q, Chen L, Yang Z, et al. Metabolic effects of bariatric surgery in type 2 diabetic patients with body mass index < 35 kg/m2. 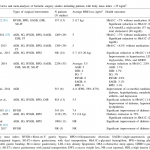 Diabetes Obes Metab 2012;14(3):262–70. Reis CE, Alvarez-Leite JI, Bressan J, Alfenas RC. Role of bariatric-metabolic surgery in the treatment of obese type 2 diabetes with body mass index < 35 kg/m2: a literature review. Diabetes Technol Ther 2012;14(4):365–72. Parikh M, Issa R, Vieira D, et al. Role of bariatric surgery as treatment for type 2 diabetes in patients who do not meet current NIH criteria: a systematic review and meta-analysis. J Am Coll Surg 2013;217(3):527–32. Maglione MA, Gibbons MM, Livhits M, et al. Bariatric surgery and nonsurgical therapy in adults with metabolic conditions and a body mass index of 30.0 to 34.9 kg/m2. Rockville: Agency for Healthcare Research and Quality (US); 2013. Ngiam KY, Lee WJ, Lee YC, Cheng A. Efficacy of metabolic surgery on HbA1 c decrease in type 2 diabetes mellitus patients with BMI < 35 kg/m2–a review. Obes Surg 2014;24(1):148–58. Adegbola S, Tayeh S, Agrawal S. Systematic review of laparoscopic adjustable gastric banding in patients with body mass index ≤35 kg/m2. Surg Obes Relat Dis 2014;10(1):155–60. Müller-Stich BP, Senft JD, Warschkow R, et al. Surgical versus medical treatment of type 2 diabetes mellitus in nonseverely obese patients: a systematic review and meta-analysis. Ann Surg 2015;261(3):421–9. Rao WS, Shan CX, Zhang W, Jiang DZ, Qiu M. A meta-analysis of short-term outcomes of patients with type 2 diabetes mellitus and BMI ≤ 35 kg/m2 undergoing Roux-en-Y gastric bypass. 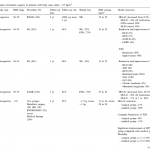 World J Surg 2015;39(1):223–30. Panunzi S, De Gaetano A, Carnicelli A, Mingrone G. Predictors of remission of diabetes mellitus in severely obese individuals undergoing bariatric surgery: do BMI or procedure choice matter? A meta-analysis. Ann Surg 2015;261(3):459–67. Cummings DE, Cohen RV. Bariatric/metabolic surgery to treat type 2 diabetes in patients with a BMI < 35 kg/m2. Diabetes Care 2016;39(6):924–33. Cohen R, Le Roux CW, Junqueira S, Ribeiro RA, Luque A. Roux-en-Y gastric bypass in type 2 diabetes patients with mild obesity: a systematic review and meta-analysis. Obes Surg 2017;27(10):2733–9. O’Brien PE, Brennan L, Laurie C, Brown W. Intensive medical weight loss or laparoscopic adjustable gastric banding in the treatment of mild to moderate obesity: long-term follow-up of a prospective randomised trial. Obes Surg 2013;23(9):1345–53. Parikh M, Chung M, Sheth S, et al. Randomized pilot trial of bariatric surgery versus intensive medical weight management on diabetes remission in type 2 diabetic patients who do NOT meet NIH criteria for surgery and the role of soluble RAGE as a novel biomarker of success. Ann Surg 2014;260(4):617–22 discussion 622–4. Wentworth JM, Playfair J, Laurie C, et al. Multidisciplinary diabetes care with and without bariatric surgery in overweight people: a randomised controlled trial. Lancet Diabetes Endocrinol 2014;2(7):545–52. Wentworth JM, Burton P, Laurie C, Brown WA, O’Brien PE. Five-year outcomes of a randomized trial of gastric band surgery in overweight but not obese people with type 2 diabetes. Diabetes Care 2017;40(4):e44–5. Ikramuddin S, Korner J, Lee WJ, et al. Roux-en-Y gastric bypass vs intensive medical management for the control of type 2 diabetes, hypertension, and hyperlipidemia: the Diabetes Surgery Study randomized clinical trial. JAMA 2013;309(21):2240–9. Ikramuddin S, Billington CJ, Lee WJ, et al. Roux-en-Y gastric bypass for diabetes (the Diabetes Surgery Study): 2-year outcomes of a 5-year, randomised, controlled trial. Lancet Diabetes Endocrinol 2015;3(6):413–22. Ikramuddin S, Korner J, Lee WJ, et al. Durability of addition of Roux-en-Y gastric bypass to lifestyle intervention and medical management in achieving primary treatment goals for uncontrolled type 2 diabetes in mild to moderate obesity: a randomized control trial. Diabetes Care 2016;39(9):1510–18. Chong K, Ikramuddin S, Lee WJ, et al. National differences in remission of type 2 diabetes mellitus after Roux-en-Y gastric bypass surgery-subgroup analysis of 2-year results of the diabetes surgery study comparing Taiwanese with Americans with mild obesity (BMI 30-35 kg/m(2)). Obes Surg 2017;27(5):1189–95. Schauer PR, Bhatt DL, Kirwan JP, et al. 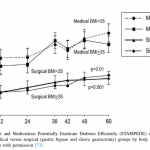 Bariatric surgery versus intensive medical therapy for diabetes – 5-year outcomes. N Engl J Med 2017;376(7):641–51. Schauer PR, Bhatt DL, Kirwan JP, et al. Bariatric surgery versus intensive medical therapy for diabetes–3-year outcomes. N Engl J Med 2014;370(21):2002–13. Liang Z, Wu Q, Chen B, Yu P, Zhao H, Ouyang X. Effect of laparoscopic Roux-en-Y gastric bypass surgery on type 2 diabetes mellitus with hypertension: a randomized controlled trial. Diabetes Res Clin Pract 2013;101(1):50–6. Lee WJ, Chong K, Lin YH, Wei JH, Chen SC. Laparoscopic sleeve gastrectomy versus single anastomosis (mini-) gastric bypass for the treatment of type 2 diabetes mellitus: 5-year results of a randomized trial and study of incretin effect. Obes Surg 2014;24(9):1552–62. Halperin F, Ding SA, Simonson DC, et al. Roux-en-Y gastric bypass surgery or lifestyle with intensive medical management in patients with type 2 diabetes: feasibility and 1-year results of a randomized clinical trial. JAMA Surg 2014;149(7):716–26. Courcoulas AP, Belle SH, Neiberg RH, et al. Three-year outcomes of bariatric surgery vs lifestyle intervention for type 2 diabetes mellitus treatment: a randomized clinical trial. JAMA Surg 2015;150(10):931–40. Ding SA, Simonson DC, Wewalka M, et al. Adjustable gastric band surgery or medical management in patients with type 2 diabetes: a randomized clinical trial. J Clin Endocrinol Metab Jul 2015;100(7):2546–56. Cummings DE, Arterburn DE, Westbrook EO, et al. Gastric bypass surgery vs intensive lifestyle and medical intervention for type 2 diabetes: the CROSSROADS randomised controlled trial. Diabetologia 2016;59(5):945–53. Murad AJ Jr, Cohen RV, de Godoy EP, et al. A prospective single-arm trial of modified long biliopancreatic and short alimentary limbs Roux-en-Y gastric bypass in type 2 diabetes patients with mild obesity. Obes Surg 2018;28(3):599–605. Berry MA, Urrutia L, Lamoza P, et al. 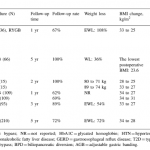 Sleeve gastrectomy outcomes in patients with BMI Between 30 and 35-3 years of follow-up. Obes Surg 2018;28(3):649–55. Noun R, Slim R, Nasr M, et al. Results of laparoscopic sleeve gastrectomy in 541 consecutive patients with low baseline body mass index (30-35 kg/m(2)). Obes Surg 2016;26(12):2824–8. Kular KS, Manchanda N, Cheema GK. Seven years of mini-gastric bypass in type II diabetes patients with a body mass index < 35 kg/m(2). Obes Surg 2016;26(7):1457–62. Hsu CC, Almulaifi A, Chen JC, et al. Effect of bariatric surgery vs medical treatment on type 2 diabetes in patients with body mass index lower than 35: five-year outcomes. 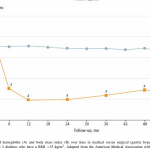 JAMA Surg 2015;150(12):1117–24. Maiz C, Alvarado J, Quezada N, Salinas J, Funke R, Boza C. Bariatric surgery in 1119 patients with preoperative body mass index < 35 (kg/m(2)): results at 1 year. Surg Obes Relat Dis 2015;11(5):1127–32. Cohen RV, Pinheiro JC, Schiavon CA, Salles JE, Wajchenberg BL, Cummings DE. Effects of gastric bypass surgery in patients with type 2 diabetes and only mild obesity. Diabetes Care 2012;35(7):1420–8. Scopinaro N, Adami GF, Papadia FS, et al. The effects of biliopancreatic diversion on type 2 diabetes mellitus in patients with mild obesity (BMI 30-35 kg/m2) and simple overweight (BMI 25-30 kg/m2): a prospective controlled study. Obes Surg 2011;21(7):880–8. Demaria EJ, Winegar DA, Pate VW, Hutcher NE, Ponce J, Pories WJ. Early postoperative outcomes of metabolic surgery to treat diabetes from sites participating in the ASMBS bariatric surgery center of excellence program as reported in the Bariatric Outcomes Longitudinal Database. Ann Surg 2010;252(3):559–66 discussion 566–7. Parikh M, Duncombe J, Fielding GA. Laparoscopic adjustable gastric banding for patients with body mass index of < or=35 kg/m2. Surg Obes Relat Dis 2006;2(5):518–22. Angrisani L, Favretti F, Furbetta F, et al. Italian Group for Lap-Band System: results of multicenter study on patients with BMI < or=35 kg/m2. Obes Surg 2004;14(3):415–18. Aminian A, Andalib A, Khorgami Z, et al. A nationwide safety analysis of bariatric surgery in nonseverely obese patients with type 2 diabetes. Surg Obes Relat Dis 2016;12(6):1163–70. Ollendorf DA, Cameron CG, Pearson SD. Effectiveness and value of treatment options for obesity–a report for the california technology assessment forum. JAMA Intern Med 2016;176(2):247–8. Ollendorf DA, Shore KK, Cameron CG, et al. Controversies in obesity management [monograph on the Internet], Boston: Institute for Clinical and Economic Review; 2015. cited 2017 Oct 8, Available from https://icer-review.org/wp-content/uploads/2016/02/CTAF_OM_Revised_Draft_Report_062315.pdf. Ollendorf DA, Cameron CG, Loos AM, Synnott PG, Pearson SD. Bariatric surgery: final report [mongraph on the Internet], Boston: Institute for Clinical and Economic Review; 2015. cited 2017 Oct 8, Available from https://icer-review.org/wp-content/uploads/2016/02/bariatric_final_rpt_040315.pdf. Picot J, Jones J, Colquitt JL, et al. The clinical effectiveness and cost-effectiveness of bariatric (weight loss) surgery for obesity: a systematic review and economic evaluation. Health Technol Assess 2009;13(41):1–190 215–357, iii–iv. Picot J, Jones J, Colquitt JL, Loveman E, Clegg AJ. Weight loss surgery for mild to moderate obesity: a systematic review and economic evaluation. Obes Surg 2012;22(9):1496–506. Aminian A, Brethauer SA, Andalib A, et al. Individualized metabolic surgery score: procedure selection based on diabetes severity. Ann Surg 2017;266(4):650–7. Mechanick JI, Youdim A, Jones DB, et al. Clinical practice guidelines for the perioperative nutritional, metabolic, and nonsurgical support of the bariatric surgery patient–2013 update: cosponsored by American Association of Clinical Endocrinologists, the Obesity Society, and American Society for Metabolic & Bariatric Surgery. Surg Obes Relat Dis 2013;9(2):159–91.